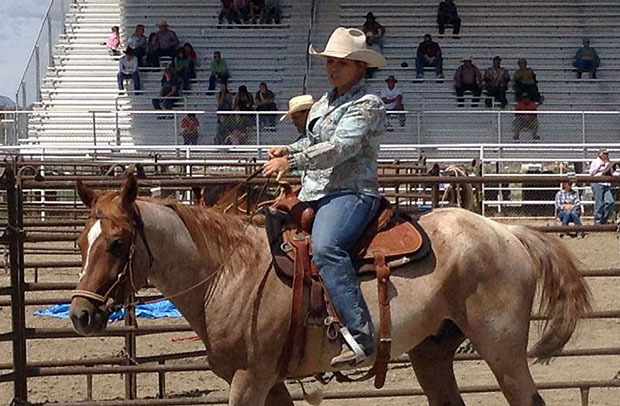 STILLWATER, Okla. – Michelle Gilles is a horse trainer and a competitor. She also is a wife and mother, and no matter where she goes, she does so with her family involved. Whether it’s working her business at their home near Lubbock, Texas, or on the road at competitions, it’s certainly family time. That works just fine. By combining family, work and competition, the native Californian is living her perfect life. That includes her ventures for Extreme Mustang Makeover events, reining contests and competing in the Colt Starting Challenge USA, the latter of which showcases trainers’ work with young horses. In fact, the next challenge is set for 6-9 p.m. Friday, Sept. 26, and noon-4 p.m. Saturday, Sept. 27, at the Oklahoma State University’s Animal Science Arena on the west edge of campus. While she utilizes the challenges for self-training, Gilles’ true competitive nature comes out in full force when it’s time to enter the arena. The Colt Starting Challenge focuses on natural horsemanship, which better utilizes a horse’s natural instincts. The techniques used are a far cry from what was done a generation ago and what many have seen regarding breaking horses on TV and in the movies. The competitions are the brain child of trainer and horseman Russell Beatty. In the two-day challenges, trainers are matched via random draw to horses that have had limited handling; there has been no saddle nor bridle ever on the animal. To close out the challenge, trainers take their hoses through a variety of obstacles in order to show how far their animals have come in a short amount of time. “I’ve been watching different competitions, and this was interesting because I am really good at getting these young ones going, and I enjoy getting the colts started,” Gilles said. “I got started by watching them, and I’ve already been to four. I watched Russell, and I really liked the sportsmanship and that with his competitions, it’s all about the horse. As a trainer, she has taken a lot from the Colt Starting Challenges. In fact, some of the lessons learned have enabled Gilles to upgrade the techniques she utilizes in her home practice. “I’m much quicker and more aggressive,” she said. “When I would get a green horse before, I would go slower and be methodical in the process. Now I have the tools to speed up the process of my training. Ideally the public wants a horst that’s past green broke in less than 30 days. While trainers in the Colt Starting Challenge utilize the same philosophy, they go about their work using a variety of methods. For Gilles, adapting along the way is outstanding for her business. “I was raised around horses my whole life,” Gilles said, noting that she began focusing on training while in college. “I started taking equine science classes. That’s where I started learning about starting colts. Gilles’ passion is evident in everything she does, and she’s excited to share it through the Colt Starting Challenge USA.